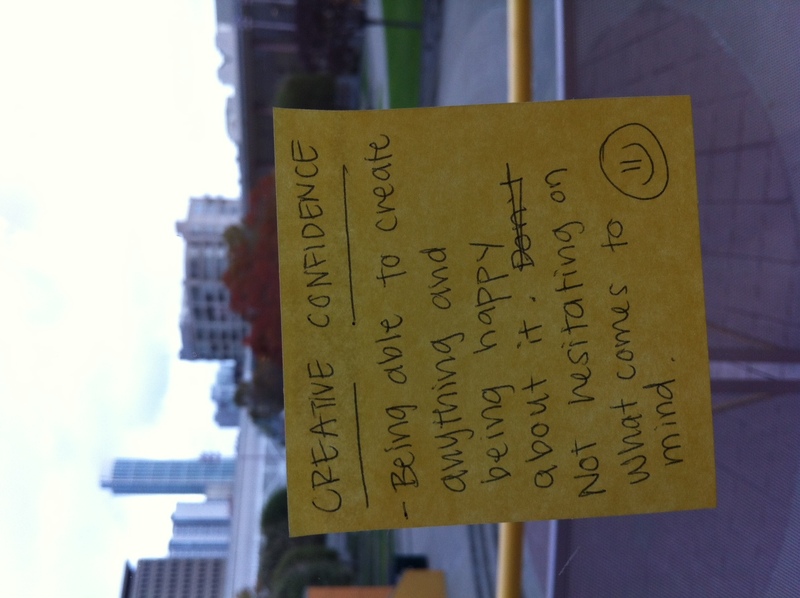 Creative Confidence is a term that gets tossed around a lot at our museum. David Kelley, of IDEO fame, mentions the term frequently, and building creative confidence is one of the guiding objectives of the Stanford d.School. We have adopted this mantra and integrated it into our educational approach and design process of “Imagine, Create, Share”, and until recently have felt pretty confident that we were imparting the skills and coaching needed to be creatively confident. However, during a recent education team meeting, one of our interns asked what exactly we meant by creative confidence, pointing out that it was hard to measure unless we knew what such confidence actually looks like. “Being able to create anything and feel happy about it. Not hesitating to build whatever comes to mind”. Once we had defined this statement, we were able to pull back and look at our programs and the way we facilitate them and ask ourselves whether we were truly imparting this knowledge and confidence to our visitors. The question we asked ourselves was “When and how are we explicitly letting our visitors know that it is ok to take creative risks and try new things? 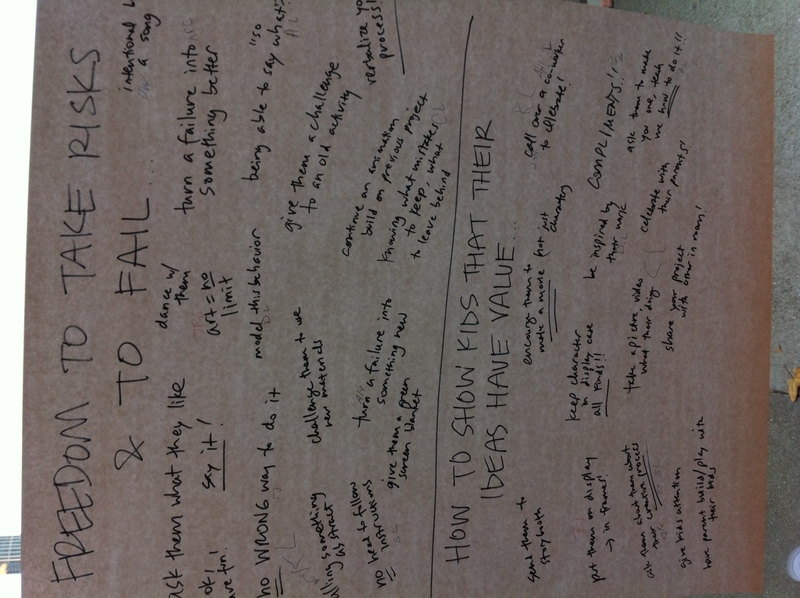 What are we doing that would let them know that their ideas have value?” The results? We realized that we encourage creative confidence in very subtle ways that don’t always resonate with visitors. 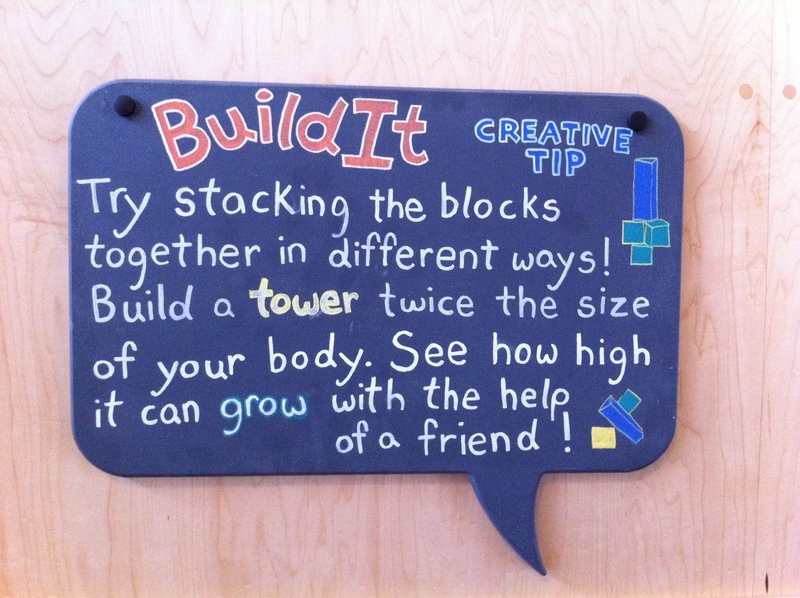 We have educational signage with “creative tips” which encourage visitors to experiment with different tools or build a castle out of foam blocks,but a recent observation showed that few visitors seem to engage with these prompts. With regards to validating the value of what our visitors create we are doing slightly better, with our Creativity Stories project that celebrates the stories behind projects, but once again the percentage of visitors who interact with this experience is smaller than we’d like. There is no wrong way to approach a project: Everyone has a different process for tackling creative projects- some start with sketches or a brainstorm, while others observe their environment for cues and inspiration. Some may find it helpful to develop a process that can be repeated while for others, finding inspiration might take a different path every time. We often develop mental blocks or construct artificial rules and constraints for ourselves, such as assuming that we can only use the materials we are given (a cardboard box for example) or that we can only use the materials as they were originally intended (i.e selling the box for $2 to buy new materials would be ‘cheating’). The next time you find yourself or a child asking questions that begin with “Am I allowed to..” or “Can I do…” affirm that the answer is always YES. Take pictures and document/celebrate the process: There has long been a sense that only the best works of art or creations are worthy of being framed, hung on the mantle or displayed for all to see. How often have you walked into a room to see a display of blurry photos, or a smudged painting left half- finished? However, the story behind those beautiful objects lies within those very same ‘mistakes’, and should be celebrated as well. The Reggio Emilia school system does an incredible job of documenting conversations and artwork from their 3-5 year old students, and displaying these documents prominently on the walls. This display and celebration of the thought process and artwork of children is an incredibly empowering model and one that we strive to emulate. The responses we get from kids when we ask if we can take pictures of their prototypes and creations to share with other kids on Facebook and our blog is priceless- huge smiles, a surge in confidence and a feeling that their work is special and worth celebrating, no matter what it looks like. At the end of a project, ask what you’ve learned and how you could do things differently the next time. There has been a lot of talk in the business world recently about the importance and power of failure. One of the key ideas that has emerged from this discussion is the idea of “Failing Forward”, or using lessons learned from an experience to drive forward your next iteration. There is a huge difference between blindly accepting failure and plowing forward and actively reflecting after each project on what worked, what didn’t work and what you would do differently the next time. A recent school group was working on a claymation movie- unfortunately their computer crashed three times during the filming process. By the third time around, the students knew exactly how to get started without any support and were much more sophisticated in their approach. Had they not been forced to pause and reflect on their process in between reboots, their final product would have been much more choppy and confusing. At the end of each project, leave time to debrief on “I liked..” “I wish..” and “What if…”. By capturing these lessons learned, you are calling out the fact that all of the ideas created had value in that they offered valuable lessons and learnings for future projects. This entry was posted in Create, Educational Philosophy, Share. Bookmark the permalink. Great post! Most people claim to be not creative, without knowing that this is the first barrier to surpass this challenge. Great blog as well! Always nice to see people taling about creativity for the kids! Thanks! Love the ideas you have going on at Creative Gibberish as well! Reblogged this on Tan Suo the World.